It’s said that the motherhood makes a woman complete. Pregnancy is that stage of a woman’s life when she is carrying one more gift of life inside her own self – her baby in her womb. This is the stage when a woman needs to take utmost care to ensure the wellness of the fetus as also her own self. She needs that extra energy to keep going and thoroughly enjoy her pregnancy; and for this she requires to be very particular about her diet, the food that she eats. Food during pregnancy has to be wisely chosen and preparing a complete diet chart would be extremely helpful during this period. As we all know, the growing baby inside the womb takes all its nourishment from the mother through the umbilical cord. So the mother should actually eat enough to feed two souls. 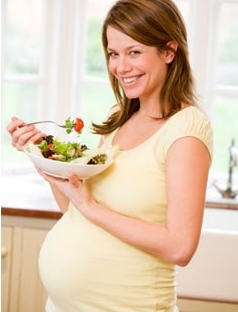 A pregnant women diet should be a balanced diet but with slightly higher amounts of iron, vitamins, proteins and minerals. The first thing that you have to see is that you include lots of fruits and vegetables, especially the green leafy vegetables in your diet. They will provide you with the vitamins A and C and also other nutrients and fibers. Berries should be an essential part of your diet. Milk will provide the calcium for the development of bones, proteins for building tissues and vitamins for protection from various diseases. Beans and red meat should also form an essential part of your diet. Whole grain, pulses, cereals and nuts are also very essential. During early days of your pregnancy, you may feel nausea also; in such case, eat less but regularly, after every short interval of time. If you take care of your diet during pregnancy, you can very well avoid many of the post delivery complications or problems. One most common problem is the under lactation or no lactation at all. Lactating mothers also need to take precautions of the type of food they include in their daily diet. They should follow a strict diet to meet the nutrition for breast feeding. Breast milk meets all the nutritional requirements of your baby. The type of food you eat during this period affects the quantity and quality of the milk. It is very natural that you eat more than your normal diet during breast feeding. It’s obvious that a diet well balanced with proteins, vitamins, minerals and fibers are good for the lactating mothers but there are certain foods which would help you to increase the quantity of the milk. Since ages, fenugreek seeds are known to do wonders with the quantity of milk production. But this should be used in moderate amount only, as its mild diuretic effect may eventually lead you to lose water from your body. Fennel seeds are also known to increase lactation. It is also believed that these seeds prevent colic in the baby. Black sesame and dill are excellent sources to increase lactation. Cumin seeds, pulses, red vegetables, nuts, sacred basil and oats are light on stomach and also increase lactation. So take care of your, diet, nutrition and food during pregnancy and also post delivery to raise a healthy baby that you can always be proud of. But remember the final mantra…drink lots of water, both during pregnancy and after delivery.